In a series of columns published in the African American newspaper the Christian Recorder, the young, charismatic preacher Henry McNeal Turner described his experience of the Civil War, first from the perspective of a civilian observer in Washington, DC, and later, as one of the Union army’s first black chaplains. In the halls of Congress, Turner witnessed the debates surrounding emancipation and black enlistment. As army chaplain, Turner dodged “grape” and cannon, comforted the sick and wounded, and settled disputes between white southerners and their former slaves. He was dismayed by the destruction left by Sherman’s army in the Carolinas, but buoyed by the bravery displayed by black soldiers in battle. After the war ended, he helped establish churches and schools for the freedmen, who previously had been prohibited from attending either. Throughout his columns, Turner evinces his firm belief in the absolute equality of blacks with whites and insists on civil rights for all black citizens. In vivid, detailed prose, laced with a combination of trenchant commentary and self-deprecating humor, Turner established himself as more than an observer: he became a distinctive and authoritative voice for the black community and a leader in the African Methodist Episcopal church. After Reconstruction failed, Turner became disillusioned with the American dream and became a vocal advocate of black emigration to Africa, prefiguring black nationalists such as Marcus Garvey and Malcolm X. Here, however, we see Turner’s youthful exuberance and optimism and his open-eyed wonder at the momentous changes taking place in American society. Well-known in his day, Turner has been relegated to the fringes of African American history, in large part because neither his views nor the forms in which he expressed them were recognized by either the black or white elite. 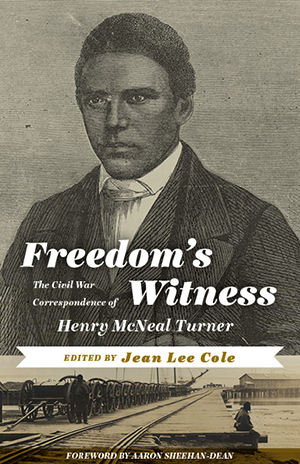 With an introduction by Jean Lee Cole and a foreword by Aaron Sheehan-Dean, Freedom’s Witness: The Civil War Correspondence of Henry McNeal Turner restores this important figure to the historical and literary record. Jean Lee Cole is an associate professor in the Department of English at Loyola University Maryland in Baltimore, Maryland. She is the co-editor of The Collected Plays of Zora Neale Hurston (with Charles Mitchell) and the author of The Literary Voices of Winnifred Eaton: Redefining Ethnicity and Authenticity. Aaron Sheehan-Dean is the Fred C. Frey Professor of Southern Studies at Louisiana State University. He is the author of Why Confederates Fought: Family and Nation in Civil War Virginia, the Concise Historical Atlas of the U.S. Civil War, and co-author of American Horizons.